The answer is easy – in the beginning. Not only is it the best place, it is the only place to start when talking about training a dog. It makes logical sense, yet the question “where do I start” is often one of the most common I receive. Before we get into where the beginning is for training a dog, what it looks like and where it leads us, let’s talk about why. You may have noticed I used both the word “dog” and “puppy” in the title of this article. More often than not, there is a reason for just about everything, and this is no exception. I think there is a lot of confusion when it comes to what the difference is between a puppy and a dog. That confusion is then compounded when new owners start to map out where to begin with their training. If someone brings home a 7-week-old puppy, it’s usually easy to understand – you have a puppy. But what about someone who just adopted the 7-month-old coonhound mix that already weighs 55 pounds? Or maybe you just brought in a year-old black lab that’s tipping the scales at 110 pounds and looks like he still might have some room to grow into those oversized paws? Although each of these examples vary greatly in both age and size, they all may have one thing in common – very little or no understanding of basic obedience. So, how do you know where do you start with each of those scenarios? To clear things up right out of the gate, I called all three examples noted in that last paragraph puppies, even though two out of the three certainly look more like a dog than a puppy. I think there is a big misunderstanding when it comes to what makes a puppy a puppy, or a dog a dog. And I don’t think it’s always completely black and white. I often see folks out there who think they have “dogs” because they look like grown dogs physically, but mentally – which we can’t see and oftentimes don’t truly understand – they are still very much so puppies. However, because they look like a dog we often think we need to take a different approach to training them, or as I prefer to call it, raising them. I think it’s important to understand that just because they look like a dog and appear physically mature, we need to be aware that mentally they are likely still immature. It takes a lot longer for pups to “grow up” mentally than physically and at times, they will give us reminders of that. Those moments when their coordination and agility, or more accurately their lack of, shines through. There are those times when their feet just don’t line up with what they are trying to do in their mind, and they can appear downright clumsy! We see this more often than not with kids, particularly in sports. Just because a 15-year-old kid is 6’ 7” tall and weighs 220 pounds doesn’t mean he plays basketball with the same level of understanding and decision making as would a similar sized 28-year-old, 10-year NBA veteran. Just because that 15-year-old kid looks like a man, it’s not realistic to expect him to make all the other life decisions with matching maturity. It takes time for both dogs and people to truly “grow up.” Our patience and understanding is usually there when it comes to humans, but greatly overlooked with canines. You will hear me refer to any dog under the age of 2 typically as a puppy. As a general rule, that’s around the point where I start to see dogs really make the turn when it comes to growing up. Foundation is where everything starts. If you have aspirations to build anything that will perform well and last, you need to be sure you put in a solid foundation. When it comes to dogs, the nice part is the foundation you need is relatively simple. Does simple mean easy? Not necessarily. When I say simple, I mean it’s not complex. Regardless of your aspirations both in the field as well as in the home, you will need to start at the same point. Heel, Sit, Stay and Here or Recall. 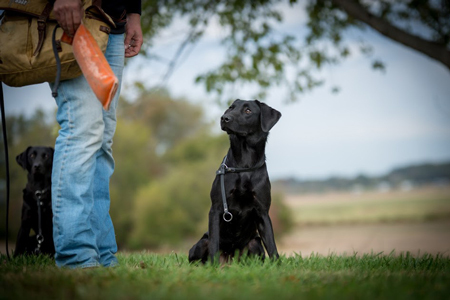 In order to do any kind of complicated drills or lessons in an attempt to develop a fine sporting dog in the field, you need a few capabilities to be there without fail. That’s where these foundation skills come into play. For example, there will come a point in training that I want to extend my dog’s ability to make retrieves at a distance of 100, 200, maybe even 300 yards or more. I certainly cannot throw a bumper out that far, so how can I get the dog proficient at extending its lines? One of the most effective ways I know is by setting up a trailing memory. I simply heel the dog out to a predetermined area or point of fall. Pitch the bumper, turn around and heel the dog back incrementally making maybe 50-yard jumps in the length or distance over three or four repetitions. Quickly and easily I can go from a 50-yard retrieve to 200 yards and with a lot of success. But, in order to do this drill I first need the dog that can heel without any issues. If I can’t get a dog to heel well throughout the trailing memory setup, I will be fighting just to set up the drill, and the chances of success in the end are slim to none. In order to build on any and all of your training, you will need to scale drills and lessons by incrementally adding complexity. If your foundation isn’t sound, you simply won’t be able to add to the drills. It’s like asking a kid to write a book. Before you can expect them to do so, you first have to teach them how to write a complete sentence, and before that they will need to be able to spell and use words correctly. Even before that, they need to learn the alphabet and what actual letters are. That makes a lot of sense to most of us. The same idea needs to make just as much sense when it comes to raising and training dogs. Over the years I have come across plenty of issues, problems or struggles with the dogs I’ve worked with, and I can say the great majority can be traced back to, and remedied by, simply strengthening the foundation. The good news is that the answer is simple. It all starts in the beginning with your dog’s foundation. In the next issue of Badger Sportsman I plan to break down the foundation – Heel, Sit, Stay and Recall or Here – even more in depth. Until then, best of luck to you in your training. Jeremy Moore has trained dogs for more than 15 years. His approach to training is to maximize a dog’s potential without using force and to bring out their natural abilities. 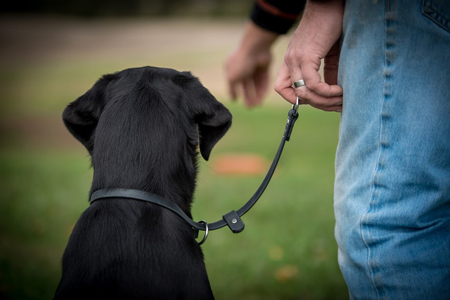 He created the DogBone training products line, which is designed to allow dog owners to successfully train their own dog by combining the right tools with the information to put those tools to use. Visit www.dogbonehunter.com or FB, IG, Twitter and YouTube @dogbonehunter for more information.